Following on from Part 1: “System Addicts vs Action Takers” In the final part of this two part series we will look at why “Action Takers” are more successful with their betting. Over the years I have spoken to many experts in the betting field. What`s interesting is they all seemed to have many things in common. The aim of this article is to discus the key factors each of these experts attributed their long-term success. Through a combination of not giving up, effective self appraisal and other motivational techniques they learned to develop a higher level of skill than average punter. Professional punters are not more intelligent or any better than the average punter on the street they simply think and act differently. Winston Churchill summed this attitude up perfectly with some of his famous quotes…. I would love to say to you all that a miracle betting system exists, unfortunately by now you`ve probably guessed it doesn’t. Far too many punters think they can simply purchase an out of the box horse racing system which contains four or five simple rules and makes shed loads of cash. If that was the case I would not be writing this article and this blog would not exist. However the good news is…successful betting is skill which can be learned by anyone prepared to put in some honest effort. My most important realization was that nothing can be achieved without taking things one step at a time. With that in mind let’s take a look at the 4 essential self-control principles you need to master before any serious betting is undertaken. In order to become a “disciplined punter” you need to experience what it feels like to both win and lose bets which have real money attached to them. This is a key area where a lot of punters become vulnerable when paper trading only. Inexperienced punters often stop using a system at the first sign of any losses. Losing runs are an inevitable part of betting and you will learn to deal with them in a more emotionally balanced way if you are fully prepared from the beginning. Taking a pragmatic approach that reflects your actions in a real life situation will improve your chances of success when betting. Set up a dedicated bank of between 50 to 100 points and use the Betfair minimum stakes of £2. Too much emotion involved in your betting decisions will be your undoing and drastically affect your confidence. This in turn will lead to fear and bad habits creeping back into your betting patterns; such as chopping and changing methods that have proved to work long-term. You must understand that systems and strategies need to be monitored over time in order to assess whether they are successful or not. It’s no good trying a proven system for a week or two then changing the rules around when you hit a few bad results. If you do follow this practice it will lead to erratic up and down results and long-term loses. Another area where punters fall down badly is: they fail to learn from past mistakes. They continue to make the same stupid mistakes over and over again. You should definitely try to improve your performance. 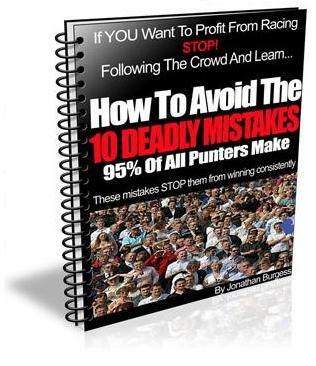 One of the biggest mistake most punters make is trying to analyze too many races. If you look at every race on every card you will become overwhelmed by the sheer volume of information available. Ultimately, it will leave you paralyzed and unable to focus on what is important. Document areas were you could improve, make notes of any particular areas of racing in which you have performed well in the past. Keeping good records will help you to do this. Try to specialize in a particular type of racing that you like. There is far too much racing in the UK these days and knowing more about one type of racing is more productive than knowing a little about all types of racing. Unfortunately the majority of betting systems manuals will not help to prepare you mentally for the task in ahead. They are developed by BS*** marketers with an alteria motive, which is to make money from system sales; not following the advice contained within them. Using these useless systems means bettors are much more likely to have an emotional reaction to losses because the most common betting problems punters experience are not covered; rarely do these guides offer any kind practical solutions, or self awareness protocols and tips. If you haven’t made regular profits from your betting activities in the past I recommend you appraise your general approach, which is ultimately crucial to your future success. So, it may take some time and effort over these next days or weeks, but look upon your efforts as the best investment you can make. After all you`ll be investing in yourself and part of your financial future. Take the time and trouble to follow my guidelines and you will reap the long-term benefits. That’s how we all learn. Anyone who thinks they can get away without making any, or who, indeed, claims to be infallible, will ultimately fail. There are lots of ways to make money betting; and there are lots of ways to lose money from betting, the trick is learning to evaluate and quickly discard the latter. Remember anyone who promise`s you instant wealth or makes absurd claims that your are going to win £1000`s a week should be avoided like the plague. Be realistic and treat betting the same as any other investment. You can’t turn a few hundred into a few thousand its just not going to happen. However following the right advice and proven methods, with patience and discipline: will make you realistic long-term profits. I’d be interested to hear your thoughts on this area of “Proven Betting psychology” Are you someone who’s trying to make sense of all the hype and BS online, or have you actually come to realize that perhaps it’s better to take things step by step and master the fundamentals first? I’d be interested to know your thoughts. Get your FREE copy from our FREE downloads page NOW! That’s an interesting way to bet! how often do you make a profit betting this way ? I do place betting myself……..